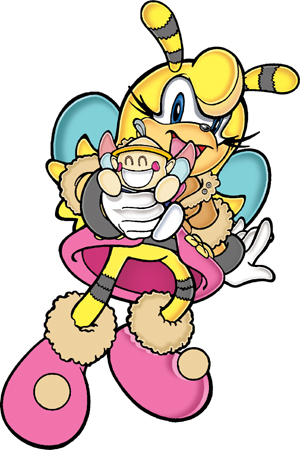 Saffron was a childhood friend of Charmy Bee, residing in Golden Hive Colony. When their marriage was arranged, Charmy decided to flee from his royal responsibilities. Saffron was unable to understand why Charmy was so upset, and remained alone for some time after Charmy fled to Angel Island. Almost a year later however, Charmy returned home and accepted his role as prince, becoming Saffron's fiance. Months later, Charmy and Saffron found themselves meeting up with Charmy's friend Knuckles the Echidna, who at this point had evolved into Chaos Knuckles When the two saw scientists from Albion trying to drain Knuckles of his powers, the two shrunk down to bee-sized mode and prevented them from succeeding. Following the conflict with the Xorda, the Eggman Empire began taking over numerous sections of Mobius In 3237, Eggman had his Egg Pawns attack Golden Hive Colony. The colony was overrun, forcing Charmy and Saffron to flee and take shelter in Knothole. It was at this point that Saffron joined the Chaotix when Charmy re-joined the group. Along with the Chaotix, Saffron participated in the liberation of a Dingo-run concentration camp, freeing numerous Echidnas. Shortly afterwards, she remained behind to protect the Master Emerald while the rest of the Chaotix freed Knuckles' father Locke from captivity. When Mammoth Mogul, the Destructix, the Arachne and Ixis Naugus joined forces, Saffron assisted the Knothole Freedom Fighters and the Chaotix in their battle to regain the Sword and Crown of Acorns. Some time later, Saffron was amongst the majority of the Mobians captured by the Egg Fleet during the destruction of Knothole and sent to the Egg Grape Chambers. After Sonic and the few other Mobians who were not captured rescued everyone and transported them all to New Mobotropolis, Saffron tried to help Charmy regain his memories, which he'd partially lost during his brief moments in the Egg Grape Chamber after it was activated. She was relieved that Charmy still remembered her. After the Enerjak ordeal, Saffron joined the Chaotix in their mission to defeat the Dark Egg Legion in New Megaopolis as well as destroy one of Eggman's communication relays. Saffron went with Charmy and Ray the Flying Squirrel to set up the explosives in the communications relay station while Sonic and the Chaotix fought the Dark Egg Legion and kept them preoccupied. She soon found herself contacting the Chaotix when the Dark Egg Legion retreated to their exact position, asking for backup. After the Dark Egg Legion was again distracted by the rest of the Chaotix, Saffron detonated the bombs, destroying the relay station. Weeks later, Saffron played a key part in the final push against the Eggman Empire. First, she and the rest of the Chaotix flanked the Dark Egg Legion and forced them to retreat. Following this, she, Charmy and Ray managed to get onto the Egg Phoenix and plant Tails' Neutralizing Mines on its hull, thus enabling Tails to disable it and cause it to crash.